This is a group of seventeen college students from Wichita, KS. 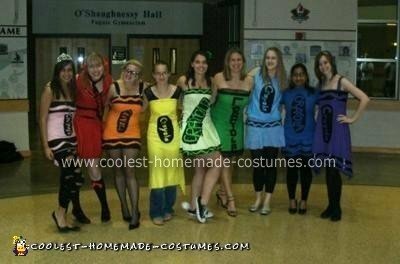 We are dressed up as Crayola crayons (ladies) and markers (boys). 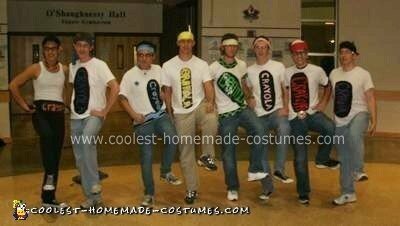 Each person made their own costumes to reflect their personality. I , Rusty (the Pink Crayola), came up with this idea, and we planned and began the creative process in early September. 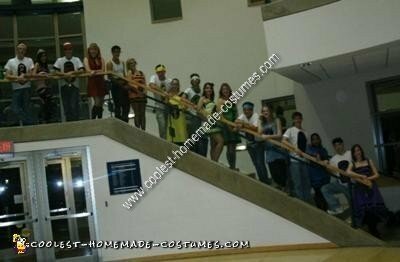 The making of the homemade crayon and marker group costumes was very fun and it was a great bonding experience. Unfortunately, the study room in the dorms looks like it was hit by a flannel tornado. And my room… is destroyed. But in the end it was worth it. Before the group pictures, we all had to wait for the orange Crayon and the light blue marker to get back from an improv meeting, so we all played a juvenile game of ‘down by the banks’. When they arrived, we finally took the pictures and then went to our Halloween dance party. It was AMAZING!